The 99% -- why not stop feeding the 1% and live our own lives? Are you working long hours for little pay and no rights, if you're working at all? Are we, the 99 percent, donating our labor to the 1 percent, … almost for free? I strongly believe we can take actions ourselves without asking the 1%. The most important part is our health so we need high quality foods, … locally produced. 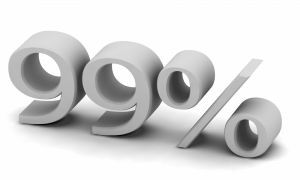 The best part of the Occupy Wall Street Movement is that they are raising the awareness of the 99 percent on a global scale. The message: "He' folks there's something going on we don't want" Stop living on the autopilot! Be aware that the dept-money-system that is forced upon us is not taking you anywhere you want to go. Its only making us work like a slave. I became a 'Conspiracy thinker' or rather a 'Conspiracy knower"
The 99 percent must abandon fear because it is the most advanced weapon the one percent is using against us! The 99 percent must know the road to freedom does exist. The 99 percent needs to control there feeling and learning to life, the unlimited power of the mind! What is your Decision Making Reference Frame?